Fig. 9 Demographic theory of transition. Changes in rates of fertility and mortality accompanying industrialization in which, after a phase of rapid population increase, a previous pattern of population equilibrium involving high birth rates and high death rates is replaced by a different equilibrium involving low birth rates and low death rates. the changes in levels of fertility (see FERTILITY RATE) and mortality (see DEATH RATE) accompanying INDUSTRIALIZATION, which lead one pattern of population equilibrium, characteristic of preindustrial societies, to be replaced by a different equilibrium, characteristic of mature industrial societies. a concluding phase, in which birth rates fall, leading to a new equilibrium. Explanations usually advanced for this pattern of population change are: improvements in public health in phase (b), followed by changes in economic and cultural orientations in phase (c), leading to a reduction in preferred family size. If this pattern of demographic change can be taken as characterizing the classic historical process of industrialization, the question that today arises is whether the pattern is likely to be repeated in newly industrializing societies, or other contemporary societies undergoing MODERNIZATION. In many of these societies rates of population growth, and levels of social disruption, have been greater than in the middle phase in earlier European patterns of demographic transition. In some societies significant economic growth has been difficult to achieve, and population growth has not been associated with improvements in living standards. It remains to be seen whether a new equilibrium will be established under these very different circumstances. In this perspective, the theory of rational action of the individual, on the line of the second demographic transition theory, take into account also the economic and social changes in the CEE countries in transition. The analysis of fertility rates specific by age groups confirms the demographic transition theory of postponement of childbirth and the decline in the first age group intervals. Classical stages of demographic transition theory can be recognized in this story, along with distinctive Greenlandic variations. Consistent with these trends in the social sciences, demographic discourse framed demographic transition theory in the terms of the modernization paradigm's narratives of race and gender. An earlier version of demographic transition theory was published in 1929 by Warren Thompson. Culture and reproduction: An anthropological critique of demographic transition theory. The most important of these (and of relevance for Africa) was, arguably, John Caldwell's restatement of demographic transition theory. He raised the argument that fertility transitions could occur in environments where living conditions do not appear to be improving, "that is, in contrast to the conventional wisdom of demographic transition theory which connects a fertility transition to increased prosperity and advancing structural transformation? 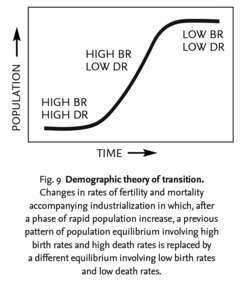 Conversely, those that resist this identification seem best able to address the questions raised by demographic transition theory.